Our Word of the Month for August 2015 is ‘tip turkey’: the white ibis, Threskiornis moluccus, often regarded as a pest in urban areas because of its scavenging at tips, etc. The evidence for this term goes back to 2009. 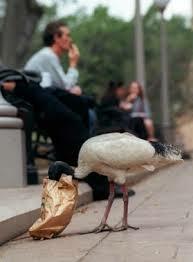 The increasing numbers of these birds found scavenging from bins in parks and in other urban areas has led to a number of similar epithets including ‘bin chicken’ and ‘dump chook’. You can read the full Word of the Month in PDF form on our website or read it in an online format.